Following yesterday’s desultory trading in the eurodollar as a result of the national holiday in the US this morning’s session has seen a resumption of the bearish sentiment first evidenced last Friday when the euro vs dollar fell below all three moving averages once again. Indeed in yesterday’s trading the high of day found solid resistance from the 14 day moving average and this has been replicated in early trading. 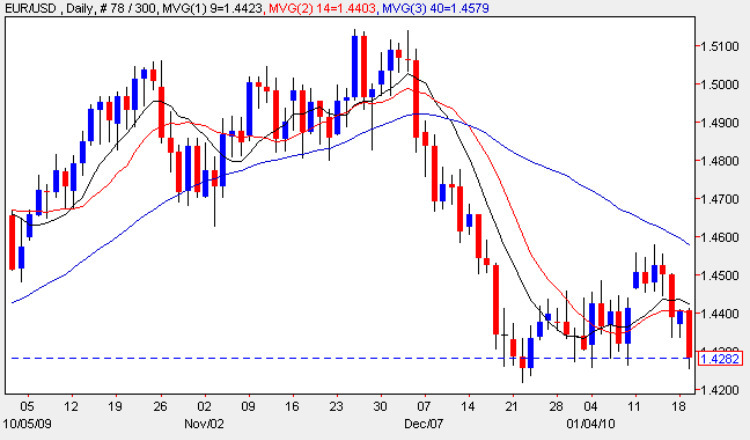 In addition the eurodollar has now broken below potential key support in the USD1.44 price region and is now trading deep within this price congestion band at USD1.4335 and a break below USD1.4250 could signal further falls, possibly as far as to retest the USD1.37 price handle. With all three moving averages now adding further pressure the outlook, in the short term, remains firmly bearish.